From this FY I understand that Dividends are taxable. But Dividend pay out is not guaranteed. If my income from FDs is below the tax slab, but any dividend received may or may not take me above the tax slab, can I submit a 15 H? 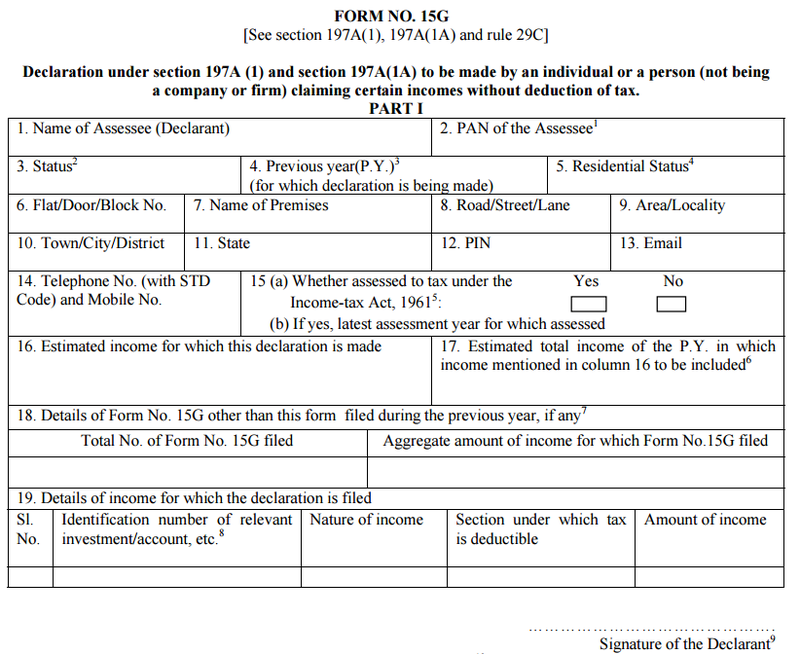 Yes you can submit Form 15H because you cannot be sure of dividend income! I have FD in three different banks and for which I have to submit 15H for three banks. 1.For Box 15 should be the sum of all interest for all three deposits of 3 banks? 2.for box 18 should I include the details of all FDs(other bank also) or only FDs of the corresponding bank? I ‘ve doubt in column 16 and 17.I’ve FD of 3,00,000.So in col. 16 i’ll put the interest amount (e.g.7% of 3,00,000=21,000).But I’ve confusion regarding col.17( which is Estimated total income).So what amount should I put ? since I dnt hv any other source of income. 17 has to be all income you expect in financial year. My wife earns interest income of amount Rs39000p.a. from her FD account. I have already filed her return on income for P.Y. 2018-19. I am filling 15g form with the bank, so that her income is not liable to TDS. I am unsure of the column 19 “Section under which tax is deductible”. 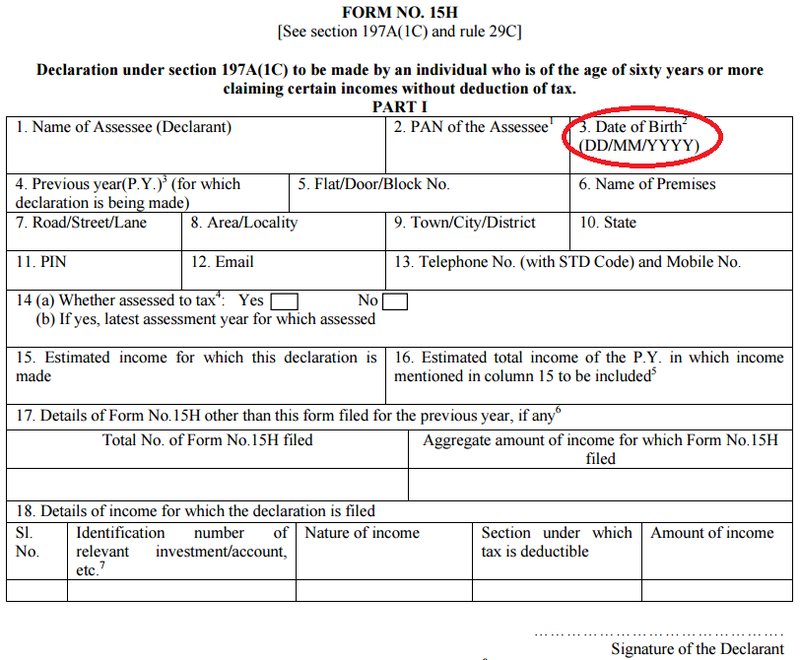 No banks cannot deduct TDS if relevant forms are submitted. However there have been instances where banks have mistakenly done so. If TDS is deducted the only way to get it back is by filing income tax return. I am submitting form 15H in 1st week of April 2018. What will be the PY (column no 4) ? 1. Suppose I have a FD in a bank for Rs 1 lac @7.5% ROI. Its maturity date is 2nd Nov 2018. Will my ‘amount of income’ in column no 18 of form 15H be like this ? 2. Should I write this figure in column no 15 also? 3. I have FDs in 3 different banks. Accordingly I have to submit 15H form to each bank. Hence total I have to submit 3 nos form in same time i.e in April 2018. What should I write in column no 17 ? 4. Is Total interest of these 3 banks be mentioned in column no 16 ? my question is suppose a pensioner is getting 30,000 Pension/month and he is having FD of RS 500000, whether he is eligible to file 15H? if i go with option b) then overall amount is above 3.5 then what option should i choose ? and what does it means wheather assessed to tax in detail ? You need to show all income so add pension income to it. I am also facing the same issue as above. But your aswer does not answer the query. Could you pls. explain. I am sorry but which part is not clear? I am also facing the same issue as yours. Did you submit the 15H. Amits answer doesnt answer your query. 1. I have 3 FD in a bank. When giving the details of estimated income do i need to provide details of each of the FD amount and rate of interest? 2. If am having joint account with my parents do i need to submit 15G form ? If yes, how will i provide the necessary information like estimated income, Total income etc. 2. In case of joint account, the tax liability is with first holder. In case your parents are first holder and they are eligible to submit Form 15, they should with their details. I open e-STDR Tax Saving of 90000 in Feb 2018 My estimated income after deduction is Rs. 2,56,000. But if I consider for Rs.2500 tax reduction due to income less than Rs. 3,50,000 , my tax calculation is NIL. I Got Permanent And Get Salary This Year 2017-18 Before That I was at 9000 per month salary with temperary employee and never fill form 16. Should i File Form 15 G ? or When should i File 15 G In April First week or Current Month in Feb Plz Suggest. I worked in a company from jan 2014 to jan 2016. Pf balanve is 90000. Currently i m not working, have savings bank ac with 7000 annual interest and dont have any other source of income . It would be of great help if you could answer these questions . How to fill column 15 16 and 17 in form 15H? What I get is that column 15 means the interest income from the branch fixed deposit say suppose “Rs. 7000” , column 16 the same amount is repeated i.e. “Rs. 7000” & in column 7 suppose I have submitted 3 15 H forms of amount Rs. 7000 each before this then the box amount would be 3 & 21000 respectively. Am I correct? My taxable income is rs. 290000. But calculated tax is 0 as 2500 tax rebate in 87A. Should I submit 15 g ? As per FY 2017-2018 , My estimated income after deduction is Rs. 2,90,000. But if I consider for Rs.2500 tax reduction due to income less than Rs. 3,50,000 , my tax calculation is NIL. Can I submit Form 15G? Your Advice is highly required. hi am sanjay and i want to withdrawl my pf i was in company from aug 2014 to july 2016 .in form 15 G which assessment year applicable for me . Which column you referring to?